Ever so often a message promotes a continuous stream of responses for days & the one entitled "Valueless Human Life" certainly has done that. Below are two additional responses. The first one is counting on the Republican Party to be the answer to our problems & calls for fast action while the second one calls for a more gradual swing of the pendulum but in the same direction. I add a few comments in red. Both messages act as though "we" have the power to vote in Republicans any time "we" want. "We" are drastically outnumbered & the sooner "we" recognize this the better off "we" will be - how else did our supposed center-right country wind up with BO, an overwhelming Democrat House, & a virtual filibuster proof Democrat Senate. Arizona Representative John Shadegg has introduced the Enumerated Powers Act since the 1990s - this bill requires any Congressman to call out the authority from the Constitution for any new spending. All 435 Members of the House take an oath to uphold the Constitution & yet only 68 have signed on as co-sponsors of this really redundant bill. It is hard to believe that we are going to find the answer to our problems by just voting in Republicans - especially those who currently undermine the Constitution every day & have not signed on as cosponsors of John Shadegg's bill. Both the article and response are correct - for a faster correction we should vote for Republicans and fast. We can not wait for enough non socialist or tea party members to come up to run, but vote for the ones who do run with an R behind them. It is critical to remove what we have in power now. I have been telling everyone to watch their words and decipher them - they are not hiding much now that their real beliefs are out. As I heard from a communist tonight in the Khrushchev era , we do not have to fight you, we will feed you small parts of socialism and you will accept them - than you will wither like rotting fruit and lose to communism. We are already more than 50% socialist thanks to both Republicans & Democrats. Without the right "non socialist or tea party members" this slide will only continue no matter how fast we vote in Republicans this portion of the two party election cycle. 1. The ballot box has an additional entry that can be check marked to indicate none of the candidates are acceptable. This is why the primaries are so very important - maybe even more important than the general election. This will send a message to both the political parties. We need more than just the two political parties. 2. The political pendulum that currently is on the extreme left cannot be swung to the right in one easy step. It will never succeed unless it is done gradually. The reality is that it is difficult for the voters to accept sudden shifts in ideology. Gradualism is certainly how we got to our present point. David Hume - "It is seldom that liberty of any kind is lost all @ once." Below is a message that I present that was posted directly on ReturnToExcellence.net by a subscriber to the blog. This will be redundant to all of you except those who do not get your messages directly from the blog & read the comments as they are posted. My comments are in red below. In this case the writer believes that all of our problems can be solved by everyone voting Republican - "just this once" - thereby "ridding ourselves of the Socialists." I refer everyone to the blog posting of December 8, 2009 entitled "How To Vote The Bums Out" that was followed by three similar messages that month that I believe comprise a better method of returning America to her founding principles - which is what many of us, but certainly not all of us, want. Please refresh your memory & see where you stand six months later on the strategy presented in that posting. After reading the message below Carol reminded me of Friedrich Hayek's dedication in "The Road To Serfdom" - "To The Socialists Of All Parties." And we certainly have enough Socialists in the Republican Party to make me feel the strategy below is only a way to perpetuate the two party system @ the citizenry's expense. I believe we need to implement a two step strategy to begin moving in the right direction (no pun intended). Step #2) For subsequent elections we can begin the process of electing strict Constitutional Conservatives. why haven't we been doing this if this is what the people want? Doug - I have been wrestling with the apathy of our citizens trying to rectify in my own mind their ambivalence to their government's actions. In my opinion, a large part of apathy is fear. Afraid of the police powers of our government is a real concern. Everyone knows when big brother comes down on you it's going to be bad. Throughout history fear of state silences men and we are at that point in the life span of our government. Fear to speak out and object to our government's overwhelming interface in our lives is genuine fear of retribution. I think that the 'multitude of fools' (even the 'gimme, gimme's) are having second thoughts about this. Hopefully, the GOP doesn't give us a worse fool in 2012 to run against him. Yes , good article, show support for those who are willing to stick their neck out. But I worry there are not enough with common sense to change the state we have stumbled on. So many people have recently told me they are throwing in the towel (@ least temporarily) with comments such as "I am not thick skinned enough to continue fighting" & "in this great Country we get the government we elect." Now with right & wrong turned upside down - with the Arizona people having to defend themselves for their very lives against criminal illegal aliens when the federal government just won't, with the Gulf oil spill continuing for over two months with absolutely no one in charge & our own government blocking any attempt by BP et al to help, & with General McChrystal being called from the battlefield in Afghanistan to the White House because of some article in a flea bitten publication it all just shows how valueless every human life other than those of the elites has become in America. Why would anyone want to enlist in the military or border patrol under these circumstances? And of course this is exactly BO's plan. Below is an anonymous piece sent to us from a subscriber to ReturnToExcellence.net that sums all of this up for us in a few short sentences. The last sentence means that if the "multitude of fools" is large enough political candidates representing people of substance in America will never win another presidential election. Although there are still some big ones coming up - with eleven states holding their primaries on Tuesday we are now well into the primary season. In addition to the normal mid-term Members of the House primary races there were races in California, Nevada, South Dakota, Iowa, South Carolina, & Maine for both Governor & Senate. 1. Outsider Sharron Angle won the Nevada Republican Senate primary & will oppose the insidious Senate Majority Leader Harry "Ringside" Reid in November. 2. SC state Rep Nikki Haley won the Republican Governor's primary & will be in a runoff because she only won 49% of the vote running against three other candidates - the closet to her had 22%. 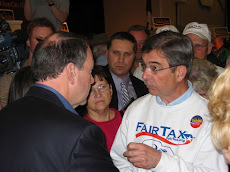 Two congressional candidates in NJ who ran endorsing the FairTax did very well with one winning outright & the other being in an election too close to call. 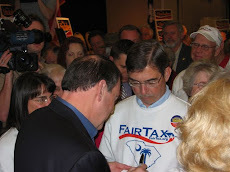 Both candidates endorsed the FairTax during their campaigns & said they will cosponsor HR 25 if elected in the fall. 1. Michael Agosta (57% & 5,397 votes) won NJ's 9th Republican district. Third place finisher Sergey Shevchuk also expressed late interest in the FairTax. 2. Anna Little leads her opponent by 63 votes – 50.2% to 49.8% with 482 of 483 precincts counted in NJ's 6th district. Little raised $22,000 to Gooch's $432,000 which is a similar story to Dave Corsi who ran his campaign on a financial shoestring but with great ideas & strong principles & lost his election 54% to 46% to a millionaire establishment Republican party line candidate. If Little ultimately wins her primary she will take on 22 year incumbent Frank Pallone in the general election. Agosta will take on 14 year incumbent Steve Rothman. The consequences of these two seemingly insignificant races in NJ are enormous so you know the statists will do everything they can to hold America back. Thanks to a subscriber to ReturnToExcellence.net for sending us this link from Snopes regarding the latest destructive phenomenon known as "bottle bombs." Carol & I have picked -up & discarded several plastic bottles each year for several years that we found on our lawn or street like those described on the link - never imagining there could be imminent danger. To check this out farther I sent the link to our friend the Somerville Police Chief Dennis Manning. 1. There is always a worry about "copy-cats" imitating what they see on videos - there are people around who want to hurt us. The balance between trying to keep the message away from copy-cats shifts in this case to more importantly trying to inform the general public re what to do to defend themselves. 2. We can throw away empty plastic bottles safely with no danger. Call 911 or your local police if you find a suspicious plastic bottle - one that is full of liquid & is bulged or expanded. Although we have had no incidence of bottle bombs in Somerville, Chief Manning has sent the link to all his policemen & plans to bring the subject up @ the next County Chiefs' meeting. He suggests that every one contact their local police re this link & also thanks the subscriber who sent this along. She may have saved someone's fingers or eyes. Thanks to a subscriber to ReturnToExcellence.net for sending this link that every one who has every been asked to take a photo of tourists will surely appreciate - it shows a scam that can cost you dearly. Carol also routinely points out to women who leave their pocket books in their push carts unattended in grocery stores of a similar situation in which they could be preyed upon.